Is your Garden full of Bee Friendly Flowers? Take a picture of your garden, or gardening experience, and share it online with the tag '#BCplants'. Contest Deadline is June 17, 2017. 4. Win a grand gardening prize worth $250. A grand gardening prize? Tell me more! 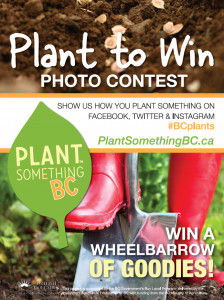 For every video or picture that you post with the #BCplants hashtag you are qualified for a ‘Wheelbarrows of Goodies’ grand prize worth $250.